This 20 day Explore South Africa tour starts in Johannesburg and ends in Cape Town. We include highlights such as the Kruger National Park, Swaziland, Lesotho, Addo Elephant National Park, the world famous Garden Route, the Karoo and many more. 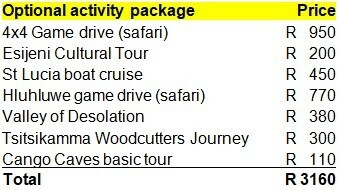 This tour offers a great combination of wild animals, diverse cultures and spectacular natural landscapes. No wonder South Africa is called "the world in one country"! We recommend that you arrive at least one day before the tour starts and at least one day after the tour ends… but the more time you can spend in Cape Town, the better- you will love it! We begin our adventure group tour from Johannesburg to Cape Town as we leave the city of Johannesburg behind us and make our way east through the coalfields of Mpumalanga. 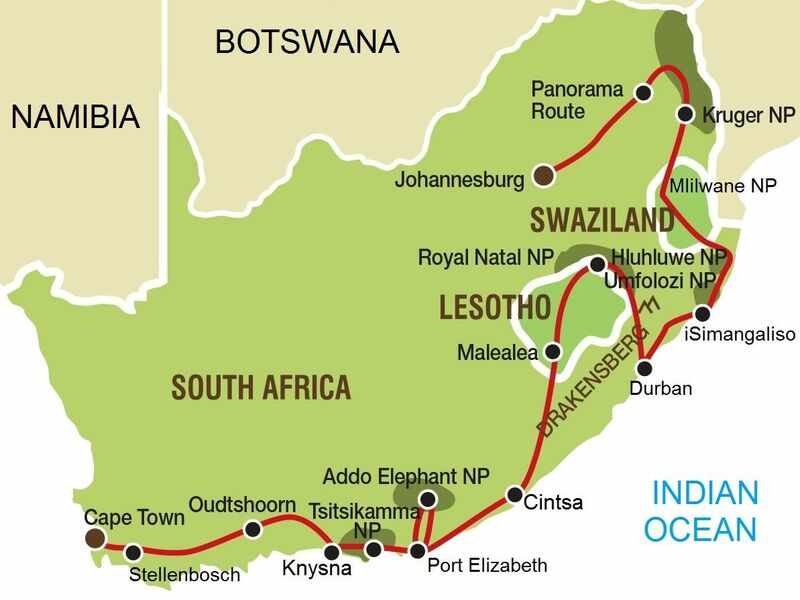 Our journey today follows in the footsteps of the old trade-routes to the Lowveld and the Kruger National Park. This afternoon there will be an opportunity to join an optional sundowner drive. Booking is essential and your guide can assist on departure this morning. This morning you will have the option to visit Port Elizabeth before returning to camp for lunch and in the afternoon we make our second visit to Addo. Recent expansion has seen Addo grow to become the third largest of South Africa’s National Parks. The unique vegetation of Addo supports a wide variety of wildlife and we will spend the afternoon on safari in search of the animals. Tsitsikamma National Park is one of South Africa’s premier marine reserves and this morning we set out to explore the rugged coastline on foot. Our hike along the Waterfall Trail sees us cover the first section of the world renowned Otter Trail. This is not an easy hike and those who prefer a more leisurely option can make use of the boardwalks to the Storms River Mouth. We return after our hike and will have the chance to enjoy the Woodcutters Journey in the afternoon - experiencing the uniqueness of the Tsitsikamma biome and learning about the history of the area and its indigenous fauna & flora. Day 18: Oudtshoorn - the Ostrich capital of the world! Travelling through the valley of the Klein Karoo, we follow the winding tarmac of Route 62. Road trips in South Africa are an exploration of the rural highlights that dot the lesser known byways of the land. No journey would be complete without sampling the offerings of a “Padstal” along the way. These small farm stalls offer a selection of homemade treats and bakes and are an important cog in the economies of rural towns. One of the more quirky highlights today is Ronnie’s Shop... a rather interesting country pub!